5.Well designed and elaborately manufactured screws and barrels for optimal plasticizing . 1. High efficiency, high extrusion speed. 2. The main electrical components are imported, ensure the stable and reliable operation running. 3. Special design of the wire wound spring machine, uniform steel wire distribution. 4. The unit of all keys using integrated design, operation is more simple and quick. 5. Ensure the high transparency of hose and uniformity of wire distribution. The length can be arbitrarily set. LANGBO MACHINERY is a company that makes manufacture of plastic pipe machinery. Company principles are manufacturing without compromising high quality and standards and being customers oriented. With young. 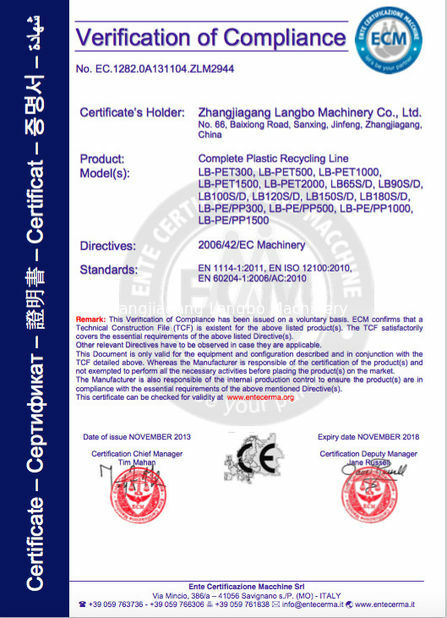 dynamic powerful engineers, we produce standard, customer design and fully automated plastic machine. Our R & D department is improving the machine quality, making low cast and increasing the durability of the machine. The manufacture of high capacity pipes are increasingly feeling the pressure of rising energy and raw material costs. 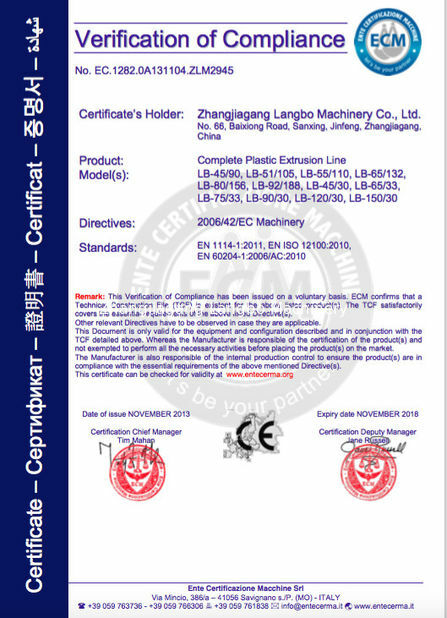 As the result of this, LANGBO MACHINERY has continuously being optimizing its pipe extrusion solutions during recent years. The result: a first rate energy balance with high output and pipe extrusion with maximum effectiveness. 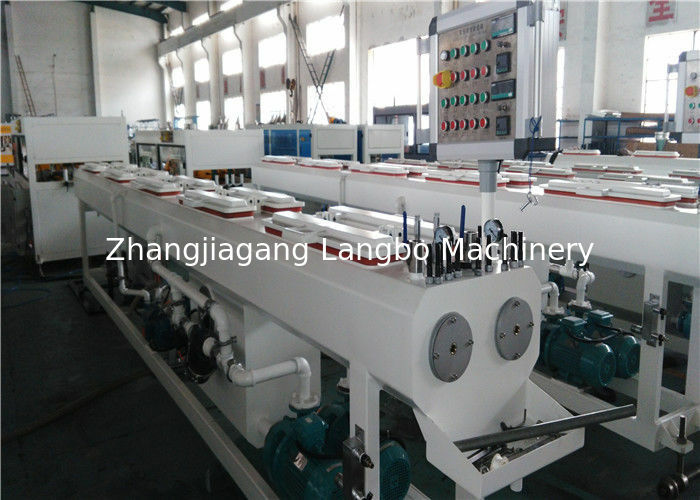 With extrusion line from LANGBO MACHINERY-everything from one source –you can be on the safe side. We accompany you from the initial idea to the finished product-reliable, competent and fair. PVC double strands electrical conduit pipe extrusion line is applied for manufacturing PVC electrical conduit pipe with the pipe diameter of 16-32mm, 16-50mm and different pressure classes that is applied in fields of building, architecture, telecom communication, etc.. Covering a large range of diameters, we supply vacuum calibration sleeves which are used inside the vacuum tanks for the calibration process. We provide vacuum tanks for the calibration and cooling process of plastic pipes covering diameters from 16 to 800 mm. All of our tanks are built in stainless steel which guarantees total absence of corrosion. Motorized longitudinal movement lets precise and fast positioning during the process. Cooling tanks are manufactured from SUS304 stainless steel. Seals at inlet and oulet of tanks has been developed ase brush seal istead of rubber seals This development let to change diameter more quickly. The pipe support in tanks are roller type supports. A wide range of haul-off units allows us to supply to the customers the ideal solution for a diameter range of 16 to 800 mm. We supply both caterpillar and belt-type haul-off units on our pipe down streams. Several types of cutting units for pipe applications. For medium and large diameter pipes, we supply our planetary cutting units. For small diameter pipes, we offer our guillotine and saw cutter. Special designing of this machine with the necessary adaption of tools PP and PVC wasted water and sewage pipes bas been made possible. The fully automatic machine that is running in line. The belling machine is capable of belling PE,PP,PVC pipes and sizes can be specified in international standards. By working synchronous with pipeline, without any human intervention machine can take pipes from the line then make belling. Pipe heating degree and blowing pressure can be adjusted. With the wide selection feature on touch screen, wastage of pipe can be prevented. By using internal PLC system, machine can work independently from pipe line. LB-32 is the model that has the highest capacity. For this model, the diameter range of 16-32mm, it is designed to produce 4 sockets per cycle. LB-63 is the model that has the highest capacity as well. For this model, the diameter range of 16-63mm, it is designed to produce 2 sockets per cycle.